While in California the tourists have a wide range of options with respect to accommodation. Among the accommodation provisions are the California hotels. The hotels in California range from luxury spa resorts to 5-star hotels, budget hotels and inns. There are numerous hotels in California distributed all over the state. 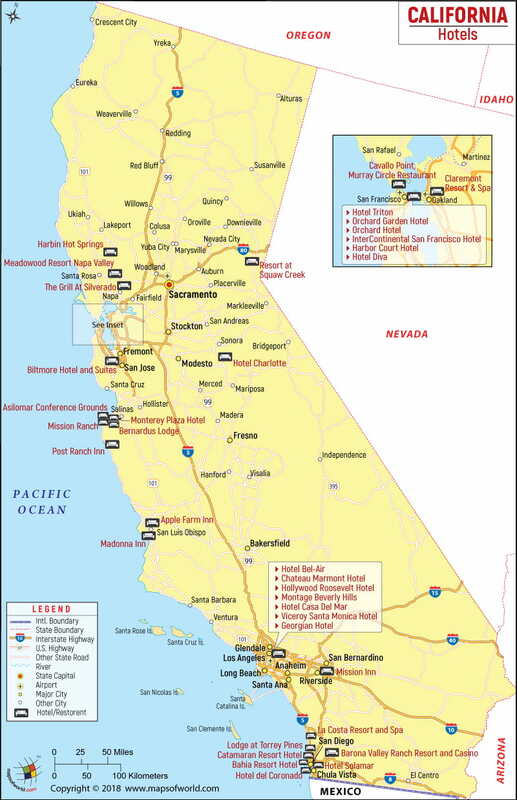 Various counties of California have a number of hotel options for the tourists. Along with the general hotel options California hotels also comprise a diverse range of interesting hotels like Beach hotels and resorts, Pet hotels, California golf resorts, Spa resorts and Tennis vacation hotels. The hotels of California are well equipped with all modern amenities and provisions and have excellent service. The California hotels also provide information to the tourists on the sightseeing and tourist sites of the state. Every California hotel caters to the needs and demands of the clients. Some hotels are known for their affordable prices, some for their features that serve business purposes while some for their luxurious accommodation provisions and amenities. Popular hotels of California include Candy Cane Inn, Renaissance Esmeralda Resort and Spa, Palace Hotel Luxury Collection, Kon Tiki Inn, San Diego Marriot Hotel and Marina, Disneyland Grand Californian, JW Marriot Hotel San Francisco etc.